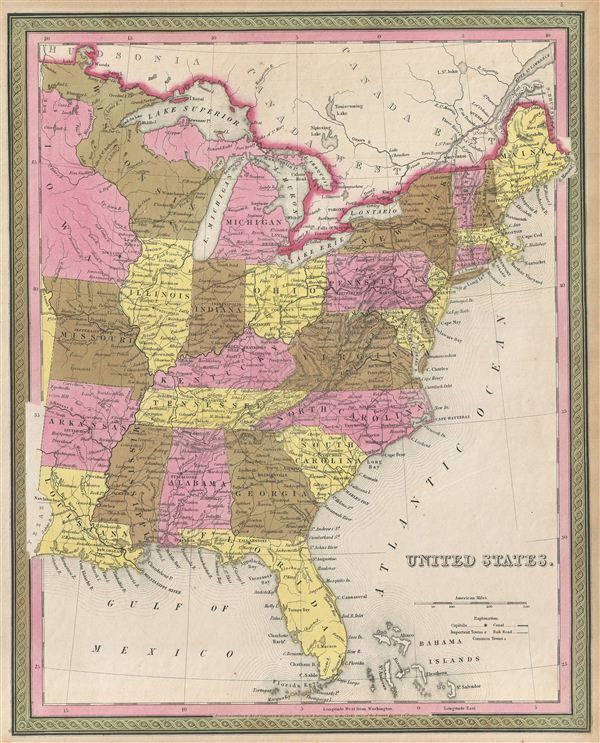 A fine example of the 1846 first edition of Mitchell's map of the United States. This map covers the United States east of the Mississippi as well as the Trans-Mississippi territories of Louisiana, Arkansas, Missouri, and Iowa. The whole is engraved and colored in Mitchell's distinctive style with green border work and vivid pastels. Political and topographical features are noted and color coded with elevation rendered by hachure. This ephemeral map details United States during a period of rapid development and westward expansion. Throughout the 1840s emigration and settlement to the west of the Mississippi led to a transformation of the national map. The present example focuses on the eastern portion of the country in the early days of the Mexican-American War. In the year of this map's publication, Texas joined the Union leading to U.S. invasion of Mexican California and the subsequent events of the Mexican-American War. Mitchell derived this map from an earlier map of Michigan by H. S. Tanner, whose plates he acquired in 1846. engraved by H. N. Burroughs for publication as plate no. 5 in the 1846 first edition of S. A. Mitchell's New Universal Atlas. Mitchell, S. A., A New Universal Atlas Containing Maps of the various Empires, Kingdoms, States and Republics Of The World, (Thomas Cowperthwait & Co., Philadelphia) 1846. Very good condition. Blank on verso. Even overall age toning.